Well, I will be starting school up in a week or so and I cannot believe that the summer is just about behind us now. Wow. Where does the time go? Going back to school is a huge deal for every family that has school aged children. You are shopping madly for supplies, clothes and shoes, getting schedules from the school, bus routes and car pool moms. You are trying to get your children as prepared as possible but what about YOU? Did you know that moms have to make sure they are prepared as well? You know, children are going back to school and the pests are looking to move back into the house for the winter. So, you not only have to prepare for back to school but you also have to prep your home to discourage those little furry friends who look for warm corners to winter in. 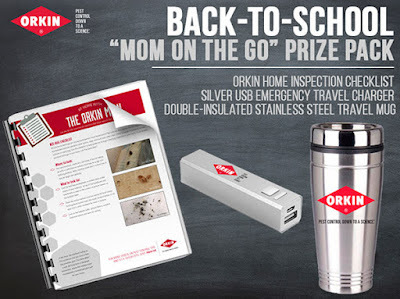 Orkin is a leader in pest prevention and I have used their products before. I am thinking about getting some mouse traps for my crawl space...last year I had a mouse build a nest in the bottom of one of my baby clothes boxes. The horrid little creature chewed through layers and layers of gorgeous clothes and RUINED them. At the bottom of the box were all the clothing shreds. I was HORRIFIED. Yes, mouse traps are definitely in order. So, I want to give you the opportunity to take a Pest Prevention Pop Quiz to see if you think like a pest! Back-to-school time is a great time to #LearnWithOrkin about pest prevention. Take the Pest Prevention Pop Quiz to find out if you know how to think like a pest! There are also some other cool things that you can do on this Orkin app, so be sure to check the whole thing out! At Orkin, we use the latest technology and unparalleled training to develop an effective treatment that's right for your needs. To learn more about our pest control based in science or to schedule an inspection, visit orkin.com or call 1-800-800-ORKIN. Make sure you keep in touch with Orkin on their social media channels as well! So, how did you do??? How smart are you? I loved taking this quiz because I was given really REALLY helpful tips on how to discourage and get rid of household pests. Very helpful. However, I didn't pass the test well...I need to go to pest summer school. Ooops! LOL! ***One other note before you enter: Each household is only eligible to win Back to School Prize Pack via blog reviews and giveaways. Only one entrant per mailing address per giveaway. If you have won the same prize on another blog, you will not be eligible to win it again. Winner is subject to eligibility verification. I learned that mice can get through a dime sized hole. I did not know flies were dirtier than cockroaches. I learned that the housefly is worse than the cockroach as far as contanmination goes. I learned that a mouse can fit through a dime-sized hole. A surprising fact for me is that mice can fit into the smallest cracks and get into your home. I learned that flies are worse than roaches for contamination! Grody! I took the quiz and learned that house flies are dirtier pests than rats or cockroaches. I learned that a mouse can fit through a whole the size of a dime. Mice can fit through way too small of a hole. I learned that flies were dirtier than cockroaches and that shocked me. get rid of standing water to keep mosquitos from breeding. I learned that flies are twice as filthy as roaches and they carry pathogens that can cause diseases such as typhoid fever and cholera. I made the honor roll on the quiz, but I was surprised that there is no scientific evidence that the natural plants have an impact on silverfish. I thought they did. I learned that flies are more dirty than roaches! That's maybe the most foul thing I've ever heard. haha. Thanks for this opportunity! Thank You for the giveaway… Mosquitoes have been known to breed in anything that can hold at least an inch of water. I had no idea that flies are worse for contamination than roaches. Ugh!